With the British festival season suffering a Glastonbury-related hole in its calendar more and more fans are looking abroad. 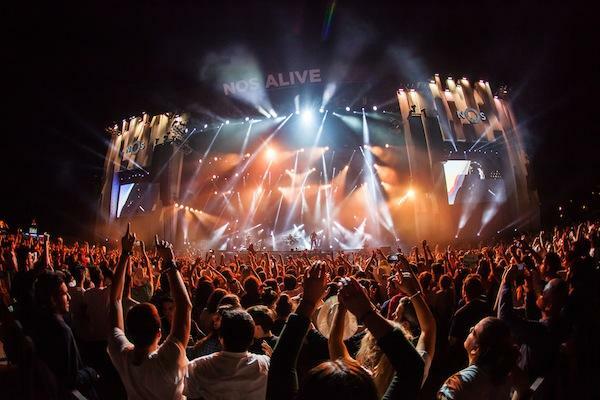 Portugal’s NOS Alive has grown to become one of the most popular and influential events on mainland Europe, with its beautiful site in the compact but effervescent city of Lisbon affording space for thousands upon thousands of fans. Returning this summer, the laidback, quirky festival is able to match big-hitters with cult favourites, its bookings showing a rare sense of bravery. From huge headliners to sophisticated opening acts, NOS Alive offers tremendous depth, situated in a historic city rapidly reinventing itself as a cultural hub. The indie giants are set to exchange their Tranquility Base for the Portuguese party that is NOS Alive this summer, and it’s come at a critical moment for the band. Arctic Monkeys’ latest is also their most divisive, a crooning, lounge-laden beast that refuses to indulge in the anthemic guitar stompers of old. Yet their live shows have scarcely been more visceral. The band’s recent date at London’s Royal Albert Hall was hailed by fans as a triumph, while festival sets have deftly mixed the old with the new. We’ll never turn down an excuse to catch Arctic Monkeys in action, but this set – in such a beautiful location, at such a prescient point in their career – looks to be particularly vital. From one crooner to another; Bryan Ferry practically trademarked the debauched lounge lizard before Alex Turner was even born, while his work with Roxy Music infused pop with art as the 70s dawned. Blessed with one of British music’s most singular catalogues, the problem with a Bryan Ferry set isn’t what he should play, but where he draws the line – nailing critical acclaimed work across four decades, this is bound to be interesting. Jack White tend to does as he damn well pleases. Whether it’s his work with The White Stripes, or The Raconteurs or with The Dead Weather, the guitarist steers a singular path, one shot through with electricity. New album ‘Boarding House Reach’ found Jack White overhauling his sound, using drums that sounded like 80s hip-hop via John Bonham, broken down synths, and a variety of extravagant guitar effects. A typically daring return, we’re desperate to witness how this will translate live. Sampha’s victory at last year’s Mercury was one of the rare occasions when the good guy actually wins. While his debut album was a charming, supple, soulful affair, the depth of his songwriting truly comes in during those emotive, intimate live performances. Festival crowds are always a challenge, but Sampha’s humble demeanour and gently insistent performances make for a beguiling experience. The perfect sunset show, in other words. A band so ingrained with the festival experience that they even wrote a song called ‘Feelgood Hit Of The Summer’ Josh Homme & Co. are back to underline their status as one of rock’s most visceral, virile experiences. Sure, their back catalogue draws in old fans, but new album ‘Villains’ has an incredible sense of bite, something underlined by the acclaim lavished on their recent huge outdoor show in London’s Finsbury Park. A titanic rock act on supreme form, this isn’t one to be missed. Famously, Future Islands were an acclaimed but almost unknown (to outsiders) American group before a fateful television appearance changed all that. Driven by un-natural energies, Samuel Herring’s incredible stage persona quickly sent them viral, becoming internationally known almost overnight. Thankfully they have the material to sustain this. 2016’s ‘The Far Field’ found Future Islands tapping into a growing maturity, with their avant synth pop merging with Herring’s highly personal, wholly idiosyncratic vocal style. Returning to Europe for another flurry of live shows, Future Islands never disappoint. NOS Alive runs between July 12th - 14th.